Premise: A mysterious fog rolls in on a secluded harbour town and weird things begin happening in its wake. Electrical equipment starts malfunctioning, washed up flotsam starts leaking water even when dried and ghost lepers start murdering people with hooks. You know, there’s an interesting thing I heard somewhere about this movie. Originally, it got pretty mixed reviews when it initially came out, to the point where even John Carpenter himself (the director) said he wasn’t fond of it and that it could’ve been better. Now, obviously, it’s gone through a bit of vindication with time and for good reason but, as a writer myself, I kinda sympathise with John Carpenter’s position on it. Because the movie is good, no doubt about that… but it feels like it could’ve been done better. I mean, let’s face it, it’s a great premise. A strange otherworldly fog rolls in from nowhere, hiding a bunch of murderous shadowy ghosts out for revenge. 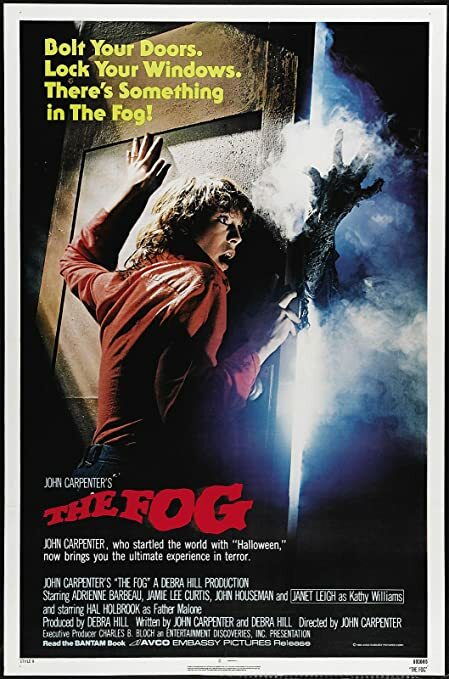 And the build-up is fantastic, establishing a cast of likeable characters and slowly adding more and more strange and mysterious events as the fog grows closer. The movie has that real classic unmistakable John Carpenter feel to it that reminded me a lot of his best films, like Halloween or the Thing. Plus the soundtrack is outstanding, using deem thrumming noise to really build up the tension and mystery and other-worldliness of the titular fog. Unfortunately, I kind of feel like the movie doesn’t really live up to that excellent premise in the second act. Oh certainly, there are a few creepy and well done scenes here and there, but the meagre few kills in the movie are relatively banal and samey, there’s no real interesting invention or playing around with the premise, the ghost just come, smash stuff up and attack people until they’re driven away. I won’t say it feels anti-climatic, since the scene where they’re driven away is pretty dramatic, but it feels kind of… underfed, for lack of a better term. Don’t get me wrong, I ultimately did enjoy the movie quite a lot. Like I said, it’s really got that classic John Carpenter feel to it and the build-up in the first act is outstanding. I just feel like the second half could’ve maybe used a bit more attention and imagination, to really do the premise justice. Also, if your big thing is ‘SIX [people] WILL DIE’, maybe don’t kill three of them off all at once very early into the story and have two extras die midway through in pretty quick succession. Still, like I said, I did enjoy it, even if I feel it could’ve been done a bit better. Was it Scary? : Not terrifyingly so, but at times it was a bit creepy, yeah. Was it Silly? : Not really?